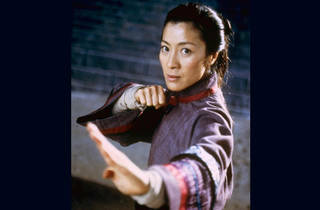 The title of most well-known female martial arts action star would have to go to the pride of Malaysia, Michelle Yeoh. In 2013 she was awarded the title of Tan Sri - the second most senior federal title and an honorific used to denote recipients of the Panglima Setia Mahkota (The Most Esteemed Order of Loyalty to the Crown of Malaysia) federal award. It’s unsurprising that Yeoh should receive such a high honour, having been a cinematic icon in Hong Kong cinema throughout the 1980s and 90s before gaining international acclaim as the motorcycle riding, show stopping Bond girl Wai Lin in Tomorrow Never Dies and as Yu Shi Lien, the resilient heroine of Crouching Tiger, Hidden Dragon. Our favourite memories of Yeoh, however, would have to be her Yes, Madam days from the 80s and early 90s, when she dressed in an all white Miami Vice-style outfit, stylishly pummeling bad guys, and as inspector Jessica Yang in Police Story 3. Playing opposite Jackie Chan, she she pulled off numerous death defying stunts (she does most of her own stunts) to save Chan’s character on multiple occasions and upstage him. “She showed the world that a woman could be just as lethal and pull off just as much high impact action as any male counterpart,” says HK film historian Mike Leeder. Yeoh has guts and she definitely made a few guys lose theirs’ during bone crunching face-offs. To say that Yeoh is just a martial arts actress would limiting, though. She’s a trained ballet dancer and an all-around entertainer with an incredible range, as demonstrated in roles like Mameha in Memoirs of a Geisha and Aung San Suu Kyi in The Lady. But what’s most captivating about Yeoh is how she can radiate elegance while smashing someone’s head with a 2x4. A true deadly beauty. 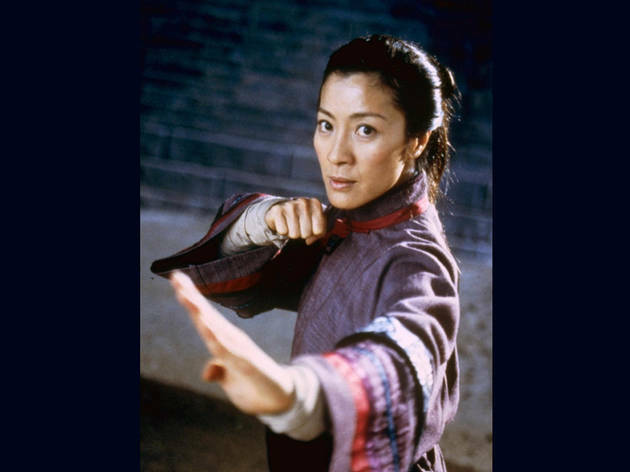 While promoting hew new film, Crouching Tiger Hidden Dragon 2: Sword of Destiny, we trade punches with the icon and discuss being a woman in martial arts. How did it feel when you were asked to play your very first martial arts role? Thrilled! I had studied ballet and dance since young and was quite engaged with athletics. I felt I could put all my experiences to good use, so there was no hesitation at all. Only high expectations. Tell me about your experience with learning kung fu? Was it a grueling process or a piece of cake? I was very blessed, I joined the perfect gym, Eddie Maher in TST. There were many real action actors and stunt guys who trained there. So almost every day, I remember, bright and early, I’d be there and stay till dinner time. It was a fun and productive training place for me. It was learning how to use speed and the projection of power while acting. I am very lucky to have been able to learn from the best stunt/action people. And I thank them for being so generous with their time and efforts. What was the worst experience you’ve ever had with a stunt? The one that had the worst impact, was the one in The Stunt Women. (aka The Story of Ah Gam) which was a homage to the stunt people. I played a stunt person and landed completely wrongly. I nosedived into the landing area and I folded and heard my back snap! I thought I broke my back or neck. Psychologically and physically, this injury took the longest to recover. Though you’ve taken roles outside of action films, people still remember you most for your fighting skills. How does that make you feel? Is it cool being known as a kickass actress or does it become a burden? To be respected and appreciated as an action or martial artist is a privilege. I definitely don’t feel it’s a burden. I am lucky to have balance, to be able to take on both dramatic and action roles. The drama in action movies are equally important. The emotions drivethe action. Male actors have always had it better than female ones. But I imagine in the martial arts genre there would be an even greater disparity. Would that be a correct assumption to make? The truth is that male actors have always dominated the martial arts world and old traditional views and values are of woman staying at home to take care of family [persist]. I would say we might need to work harder and try harder to succeed. There’s no sacrifice if you’re doing something you love or are passionate about. What does kung fu mean to you? Is it a way a life? A career? Or something more? It is a way of life. I only wish I have more time to learn and practice tai chi. Kung fu is more than a career for me. It’s exercise, it’s a lifestyle, it’s a philosophy.